At Christmas many companies seem to come out with a festive version of their product. Maybe their chocolate bar is changed to be in the shape of a snowman. Sometimes there is no difference except the packaging. However this year Mr Kipling have come out with a festive edition which is significantly different. On the Pierate Ship we know and love Mr Kipling for their fruit pies. They have long been a favourite for our gatherings even before we came up with the concept of a pie review blog. 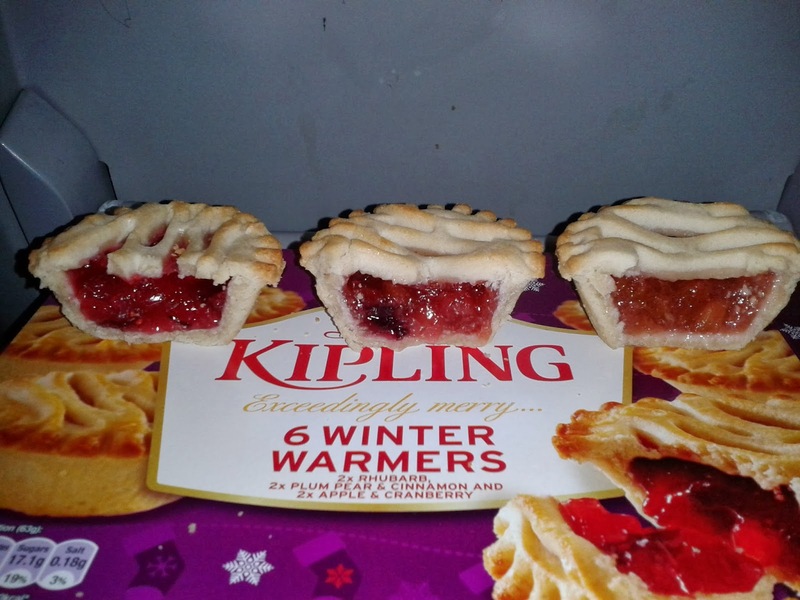 This festive season they have released their 'Winter Warmers' fruit pies which promise to make you exceedingly merry. But are they going to be a Christmas No 1 or a festive flop? We break down the merit of these 3 festive flavours. All these pies come in the traditional Mr Kipling pie size. They are the lattice top style, a bit different to the original Mr Kipling pies we know and love. I do prefer to see a fully encased pie but I did my best to over look this as the pies did look marvelous. They were all very well filled with hardly any air gaps. This certainly earned them some more points. All the pies were made of the usual, soft Mr Kipling pastry which had a great golden colour. They all had 46% filling which is a good filling to pastry ratio. Mr Kipling did a Rhubarb pie before which I enjoyed and I was glad to see it make a return. Like all these pies it was filled with their trademark sweet, fruity jelly. In this case it had a hint of that typical sour rhubarb taste. I do like sour things but it was verging on too sour for me. There was a good amount of rhubarb in the pie which added a nice chewiness to it. I missed the custard from the previous rhubarb version from Mr Kipling. A nice spin on their usual Apple pie. Again, this pie was sour due to the cranberry but I think this one got the balance just right because of the sweetness of the apple. There were whole cranberries in here which added to the texture, however there wasn't a lot of fruit and I missed the bite that a normal Mr Kipling apple pie due to the chunks of apple. With the addition of cinnamon this pie did really taste festive and I think Mr Kipling really got it right here. The taste reminded me of a mince pie but the jelly made it much more moist than a mince pie. It certainly seemed like something you would want to serve on the table at a Christmas party. The use of two different fruits added a nice variety to the flavour. The only criticism is the fruit didn't have much bite to it when compared to a regular Mr Kipling pie. So there you have it. A mixed bag in this mixed box of pies but certainly all these pies are worth trying. If nothing else it is just nice to try something different. They don't have a huge amount of fruit in but the sugar jelly tastes nice. For the portable, sweet pie market these are some of the best non-standard flavours and at £1.79 they are less than 30p each. We would like to publically thank Mr Kipling for supplying these pies to us (alongside 12 others) as a gift as part of our 4th Birthday celebrations (the only pie company to send us free pies for our birthday!) Thanks so much!